Corran Harrington is a former attorney who writes literary fiction described as radiant and revealing. She is a Pushcart Prize nominee, a Bosque Fiction Contest finalist, and a New Millennium Writings Award semifinalist. Her short stories have appeared in numerous literary publications. 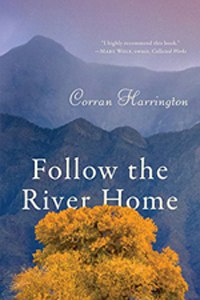 Corran’s first book, Follow the River Home, is an Arbor Farm Press release (2016). 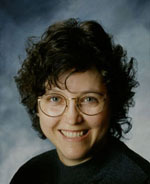 You can find her at CorranHarrington.com, on her SouthWest Writers’ author page, and on LinkedIn. What is your elevator pitch for Follow the River Home? Daniel Arroyo has suffered a lifetime of guilt over the sudden death of his infant sister, who died when he was eight years old. He now lives his middle years between that guilt and worsening episodes of PTSD from a Vietnam he left thirty years ago. When a violent encounter on a dusty highway forces Daniel to face what haunts him, he finds himself pulled back to the neighborhood of his youth, where old houses hold tired secrets. What really happened on that steamy August afternoon? The answer comes spilling from the old neighborhood, and Daniel begins to find his way home. On the surface, I want readers who may not be familiar with New Mexico’s middle Rio Grande region to gain an understanding of the physical setting and some of the cultural aspects present in that setting. I enjoy reading fiction that is set in places and among people I do not otherwise know. But I mostly want the reader to experience the rich emotional and psychological landscapes my characters traverse. For me, the joy in reading is when I resonate emotionally with a line or phrase, and that is what I want my readers to experience. Someone who I don’t know well wrote to me the other day, just to tell me that my book had given him the chills and caused him to tear up on more than one occasion. That he felt moved in that way was moving to me. Prior to this book, I had only written short fiction. So it was challenging to structure a longer piece, which became the first part of the book called “The River Reader.” The other main challenge, then, was to make consistent all the stories, which formed the second part of the book called “The River Flyway.” It was like putting together a huge puzzle, which was actually very fun for me. Tell us about your main protagonist’s flaws and strengths and the hurdles he’s trying to overcome. Daniel Arroyo is an ordinary man who comes from ordinary means. But he is scarred as a young boy by a family tragedy that goes unexplained for decades, and that consumes him with guilt. He is also a product of his times, and is often rendered fragile because of what he experienced in Vietnam. His guilt and his PTSD contribute to marital problems, and to identity issues. But Daniel Arroyo has a vast capacity for kindness and generosity, which is what ultimately saves him, and lets him begin to find peace for himself. Why did you choose New Mexico as the setting for the book? How does the setting impact the story and the characters? The setting is essential to Follow the River Home, as it forms the spine for the entire story. It is practically a character in its own. I see the setting of the Rio Grande as it courses through New Mexico as a series of detailed paintings against which the plot unfolds. As I say below, the book was originally going to be a short story collection, where the only link between the stories was the Rio Grande. As it turns out, though, the main characters’ lives had all intersected. The river, as a flyway for the migration of the sandhill cranes, becomes a metaphor for Daniel finding his own way home. What was the most rewarding aspect of writing Follow the River Home? I was fortunate to be able to work with a wonderful editor, Ladette Randolph, who is the editor of Ploughshares, one of the most esteemed literary journals in the country. I became a better writer for it, which is what I aspire to with any writing project. Tell us more about the book: where the story idea came from; how long it took to write; editing cycle, etc. I’m often asked how long it took to write this book. Since this is not the book I set out to write, my answer is somewhere between 2 and 15 years! I started writing short stories in the late nineties, and the first one was published in 2000. My intent was to create a short story collection where the only link between the stories was that each story would at least reference the Rio Grande. So the stories were set in various places along the river, from the headwaters to the sea, though most were set in the middle Rio Grande valley. A few years ago, I realized two of the stories had main characters named Daniel, but with different last names and different lives. I began to wonder, what if they were the same character? Almost immediately, all the characters and stories came together. It turned out that the main characters grew up together in the same neighborhood during the fifties and sixties, and that many of their lives intersected again in adulthood. I then wrote the whole story as a novella, which became the first part of the book. The previously written short stories became the second part of the book, and each story casts a different light on the characters and scenes from the first part of the book. It’s almost a retelling of the whole story, but from very different points of view and in a different order. The stories informed the novella, and then I went back to each story to tweak for consistency. When I was twenty, I announced to my grandmother that I was going to start writing novels. She very tactfully and wisely suggested that I first get a little more life experience. So I wrote songs for the next twenty years or so, just to keep the creative juices flowing (guitar and vocals). Sometimes I steal lyrics from my songs, and put them in my fiction. For example, a recurring line about the sandhill cranes in Follow the River Home comes from one of my old songs. I was first, of course, a reader. I had a great passion for books from the time I could read. My grandmother (who was an artist and librarian) and I came up with a plan where I would write children’s books and she would illustrate them. That never came to fruition, but it tells me I wanted to write from a very young age. My first serious attempts were in high school, with some poetry and short stories that were published in the high school creative writing magazine. At that time I submitted to a national writing competition for high school students. My work did not make the cut, but it was a valuable experience that taught me to not be afraid of submitting work, to not be afraid of rejection letters. I have to answer this with respect to two different parts of my life. My first favorite author was John Steinbeck, who I discovered in junior high school. I read everything he wrote, and found it very evocative. He could write about social and political issues through the eyes of a character’s psychological landscape, and without being pedantic. I don’t enjoy his writing so much as an adult now but was very influenced by him. And now, I have too many favorite authors to name them all. I love literary fiction—beautiful writing that aspires to be art, that is evocative, and that portrays characters’ rich, internal landscapes set against compelling plots and/or physical/cultural settings that are almost visceral. I love learning about places and people that are foreign to me. A few of my favorite authors are Andrei Makine, J. M. Coetzee, Nadine Gordimer, José Saramago, Annie Proulx, Michael Ondaatje, Ian McEwan, Claire Messud, Kazuo Ishiguro, Michael Cunningham, David Guterson, and Graham Swift. I started writing and submitting short fiction as a serious endeavor in the late nineties. I spent a lot of time learning everything I could about the process of submissions. My first story was published in a small college review in Kentucky in 2000. I wrote short stories for many years thereafter and was lucky enough to have all my stories published (amidst a wealth of rejection letters!). The thirteen stories in the second half of Follow the River Home were all previously published. Follow the River Home, published by Arbor Farm Press, is my first full-length book. I like to celebrate ordinary people who are capable of extraordinary deeds. There is something redemptive about every human being, no matter how ordinary—no matter how flawed. My prose is very lyrical, sometimes almost poetic. Writing is an auditory experience for me. I can hear my internal writer’s voice, which is the same voice that does public readings. I can also paint vivid physical settings and rich, emotional landscapes against which my characters’ lives play out. Readers often tell me my writing is very evocative. What I struggle with mostly, though, is dialogue, presumably because it cannot come from my own voice. It has to be contrived, by definition. I have overcome this weakness by being a careful listener of other people. I have also come to embrace dialogue as an effective tool to move the writing forward when I otherwise might feel stuck. First, be willing to write embarrassingly bad prose! No one will see it but you. Second, be brutal with your editing, and meticulous with your research. Learn all you can about the craft of writing. Read books about it, and read books by authors you admire. Third, be professional when you make submissions, and follow all the submission guidelines of the publisher. Finally, be welcoming of rejections. Every writer probably has enough to wallpaper his or her house! Rejections are rarely hurtful, and occasionally an editor will write a personal note, which can be very helpful and encouraging. Rejection letters are a sign that you take your writing career seriously. I am almost done with a first draft of a novel based on one of the stories in Follow the River Home. It is set in the Pacific Northwest. I am also writing two short stories, one of which is almost completed; and I just found a home for a third short story in a literary review in Wisconsin.